Finding internships and hands-on learning (and the correct freeway exits!) in a semester at the heart of the entertainment industry with the LA Program. 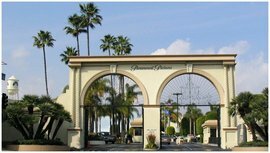 The Paramount Studios Gate greets me every morning before work. When my fellow Ithaca College classmate, Maddie Chopskie, told me this a few days ago, I knew I had to quote her in this blog. She said exactly what I was thinking. Maddie also interns for “The Doctors” on the Paramount Studios lot, and we often discuss how surprised we are every time we feel confident enough after doing something totally new here. We can attribute this confidence to having a net of alumni connections sprinkled in every aspect of the Hollywood entertainment industry. Two weeks ago, Maddie and I were stand-ins for a field shoot. From interning in the industry so far, I've learned that producing is about doing the best job with the least amount of time and money. And setting up a shoot requires blocking and planning, like putting on a play. Before the real shoot took place, Maddie and I “stood in” for the cast members as the crew figured out what camera angles were best to use during the real shoot. When we walked into the house where we were filming, the production assistant who greeted us just happened to be an IC grad! Right away I became less nervous about being on an Emmy-award winning television show shoot. We chatted about our Ithaca experience over a free lunch of falafel and hummus. I can imagine it was sort of an awkward moment for the other interns, but Maddie and I were able to find that one connection that served as an instant ice-breaker. When I was directed to move around like Jillian Michaels would do on set, I jumped right in, making the crew and other interns laugh as we joked around. It was a ton of fun. Because of that ice-breaking alumni conversation over lunch, I didn’t feel nervous, and I was able to move around the set with ease, which is just what the crew needed from us. I always knew Ithaca was well known for its Roy H. Park School of Communications. That’s the main reason why I enrolled here. But I didn’t fully understand until coming out to LA that Ithaca grads are EVERYWHERE in this industry! In fact, just the other day, Maddie and I were talking about Ithaca. Then, someone else in the production office mentioned Ithaca. It turns out that someone who works there, Jodi Eisenberg, had just graduated in Spring 2010 from our school! After continually meeting people who work in television and film production as well as hearing from industry professionals that Ithaca is well represented here, I am more confident at my internship. Why? Because I know that this combination of communications classes, student media, guest speakers, and the general Ithaca experience these past couple years have made me ready to network and pursue a career in the media/entertainment industry. These alumni in LA are doing their thing, and they went to my school. That’s assuring. My LA lesson: make those connections with IC alumni. When you leave the internship, maintain those connections. If someone remembers that the intern had a bright, sparkling personality and a willingness to jump into tasks with confidence, they’re more likely to remember that intern when it comes time to apply for jobs. Also, if that intern happened to graduate from the same school as the person choosing who to hire, that’s a plus, too! Who knows — maybe this won't be my only job behind that famous Paramount Studios gate on Melrose Ave. It's all about connections.